Any thick sports or Aran yarn with a yield of 90 to110 yards per 50 g ball should do. I used Mountain Goat from Mountain Colors in the shade Northern Lights, with needles size US seven, and I got a gauge of about four stitches and five rows per inch in stockinette stitch. The finished piece measures about 10 or 11 inches across and 5 inches tall before sewing. 1) garter stitch: knit every row, no purling at all. Continue for number of rows indicated in pattern. 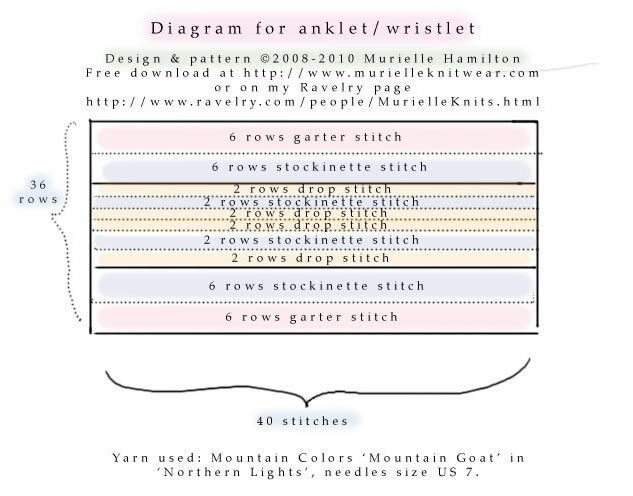 2) stockinette stitch: Row 1: knit all; Row 2: purl all; repeat for number of rows indicated in pattern. 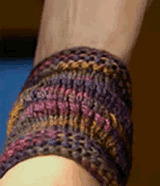 3) drop stitch section: Row 1: knit 1, wrap yarn around needle from the back to the front once; repeat to end of row. Row 2: purl 1, let wrapped yarn drop; repeat to end of row. From time to time, give a good pull from below to make the dropped sections fall into place. Cast on 40 stitches loosely with needles size 7 US. Do 2 drop stitch sections (4 rows, total 20 rows). Do 1 simple drop stitch section (2 rows, so 24 rows total). Bind off nice and loose. Make the second anklet the same. Weave loose ends securely into the fabric. Press the two rectangles on the wrong side quickly with a hot steam iron. Match the left side to the right side of the rectangle with the good side (stockinette side) on the outside. Use your preferred mode of assembly, Kitchener stitch or mattress stitch are best, but you could also machine sew the seam on the wrong side, or lace it up with ribbon, leather thong or shoelaces - why not. Decide if you want an anklet or a wristlet. Measure the circumference of your wrist or ankle. If a wristlet, measure the widest part of your hand with your thumb tucked under, as you′ll have to get it over that. Knit a garter stitch swatch (20 x 20), count how many stitches you get. I got 4 st and 5R per inch, as I like to knit a relaxed stitch. In my case, my wrist is 5 3/4 inches diameter -- which is why I ended up wearing this as an anklet, my ankle being 8 1/4 inches diameter. The part of my foot that goes from the tip of my heel to the top of my arch, is 12 inches around (high arch). As to my hand, the widest part measures 8 inches around. The point is, when you begin and end, make sure you have enough give in the cast-on/bind off to clear that part of your foot or hand. Since I measure my swatch flat, not stretched, I′ll assume that 28 stitches (= 7") will be enough to stretch to 8" when I pull it on. The length doesn't really matter, you can stick to the pattern for that.